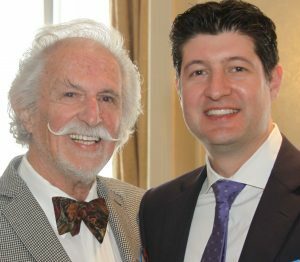 Manny retired from the Board of Directors in 2005 yet remained committed to JVS Toronto by continuing as an Honorary Director and Member of the Corporation. JVS Toronto recognized Manny’s 75th birthday in 2006 by establishing the Manny Mitchell Conference Room at its head office. This was followed in 2008 by the creation of the Manny Mitchell Award for Excellence in Volunteerism that continues to be awarded each year at JVS Toronto’s Annual General Meeting. To the agency’s good fortune, Manny introduced his son-in-law Paul Habert to us in 2007. Paul followed in Manny’s footsteps by joining the Board of Directors, and later serving as Chair and participating in the Board’s fundraising committee. Paul continues to be a strong supporter and Mitchell family link to JVS Toronto, and is always available when called upon to lend a helpful hand. We express our appreciation to Manny for his years of service and dedication to JVS Toronto, and continue to benefit from the important contributions he made to the agency. Our deepest sympathy is extended to Manny’s wife Merle, and his entire family. Our community has lost a wonderful man yet his philanthropic spirit lives on.